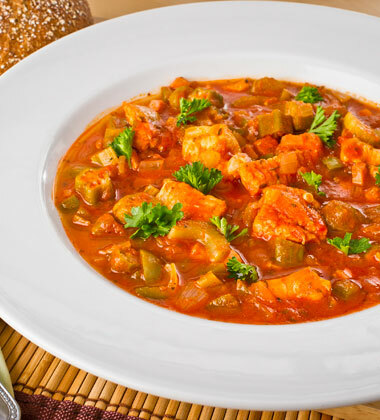 Cajun flavors are captured in this classic stew full of onion, peppers and celery along with a hint of smoke and a finish of catfish, lemon and hot sauce. Vidalia onion, diced	 30 oz. 1 1/2 qt. green pepper, diced	 1 lb. 1 qt. celery, diced	 1 lb. 1 qt. Cajun spice blend, no salt added	 2 tbsp. 1. In a large stew pot, heat oil over medium-high heat. Add onions and sauté 5 minutes. Add peppers and celery. Sauté 5-6 minutes. Mix in ham, spice blend and paprika. Continue to cook 2-3 minutes, stirring often. frozen okra	 1 lb. 1 qt. catfish, raw fillets, cut into 2-inch pieces	 2 lb. 1 1/2 qt. 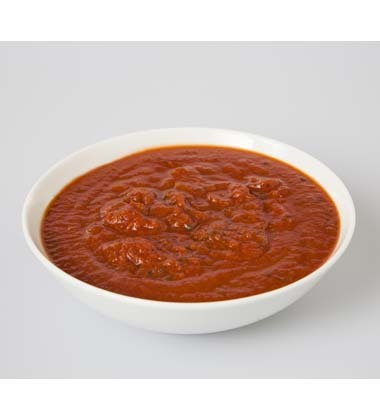 hot pepper sauce	 1 tbsp. 2. Add Prego® Traditional Pasta Sauce and water. Bring to a boil, reduce heat and simmer 45 minutes, stirring often. 3. Stir in okra and catfish. Simmer for 20 minutes. 4. Just before service, stir in parsley, lemon juice and hot sauce. brown rice, cooked	 3 qt. 5. To Serve: Using an 8 oz. ladle, portion 1 cup of stew over 1/2 cup rice in a bowl. Vidalia onion	 30 oz. 1 1/2 qt. celery	 1.25 lb. 1 qt. catfish	 2 lb. 1 1/2 qt.